In the early 1600s a consortium of Dutch merchants called the VOC (the United East-India Company), colonised the spice islands, now known as Indonesia, mainly for the rich harvest of peppercorn, cloves, cinnamon and other spices. These spices arrived in the North-European diet of potatoes, cabbage and kale like the sudden appearance of Californian sunshine into the grim Dutch winter (nobody has more words for "rain"), and made the merchants who imported them by the shipload fabulously rich. The 10,000 mile diet was born. Of course, VOC merchant ships had sails, so their carbon emissions was exactly zero per mile. We've come a long way from potatoes and cabbage: today, year round, our tables are a true cornucopia of everything the world has to offer. Oranges from Florida, maple syrup from Vermont, apples from Washington, and everything fruit and veg from California, not to mention rice and mangoes from Thailand, all manner of cheeses from Europe, lamb from New Zealand, even water from Fiji. All those delicacies travel on average about 1,000 miles to get to the American table; and the supply chain (before the foods get to the packager / bottler / processor) accounts for an additional 4200 miles - and none of that travel is powered by wind. Indeed, the diesel-fueled trucks, the container and bulk transport ships, and air planes contribute significantly to particulate air pollution. Suppose we were to free our food from fossil fuels? Many of us are questioning the wisdom of shipping and trucking in our food from so far away, and have started using more local options, such as local farmers' markets and community supported agriculture (CSA) where you become a "member" of a farm and get a share in the farm's harvest. But like many other things in the quest to be green, the question of food miles is a vexed one. If you insisted on locally sourced dinners all year round, those of us who live in colder climates would be consigned to potatoes and cabbage to sustain us through the winter, with perhaps some grains, plus preserved fruits and vegetables. Forget about pepper and cinnamon. In the growing season, things are even more complicated: In Europe, where produce labels in grocery stores state the country of origin, people started to question why their green beans should come from Kenia, even in the summer when they could have come from the farm right outside of town. Studies were done. They showed that the carbon footprint of transporting a pound of green beans from Kenia to, say, the UK was smaller than the footprint of the consumer taking the car to the Sainsbury's superstore outside of town to buy that pound of green beans. Detractors of locavorism are fond of repeating the statistic that growing tomatoes in warm sunny Spain and shipping them to cold Sweden is greener than trying to grow them in Sweden, because the latter would require energy-hogging hothouses. Add to that the fact that wages are lower in Kenia (and even in Spain) than in Sweden, and that transportation costs are low enough (apparently), and the astonishing food migration becomes viable - financially speaking. The same argument holds for all those blueberries and raspberries from Chile and Argentina that so incongruously crowd US fruit isles in February. Even from a carbon point of view, a life-cycle analysis by Christopher Weber and Scott Matthews at Carnegie Mellon has shown that the emissions of greenhouse gases (GHG) associated with the production of food (even in faraway places) is much larger than that caused by its transportation. "Transportation as a whole represents only 11% of lifecycle GHG emissions, and final delivery from producer to retail contributes only 4%." 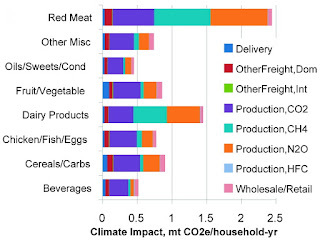 The figure below, reproduced from that article, is a bar graph of the total, life-cycle climate impact (GHG emissions in millions of tons of CO2 equivalent per household per year) for the production and transportation of various food groups. The left-most part (dark blue) of each bar represents the carbon footprint for delivering food from the producer to the retail outlet (nobody but you can tell whether and how far you walk or bike or drive to your grocery store). On most bars in the graph, you can hardly see that left-most portion. The red and grass-green portions of each bar show the footprint of the transportation of raw materials, for instance, trucking grains to the facility that makes breakfast cereals, or shipping soy to be fed to livestock. Averaged over all foods, the transportation portion of GHG emissions is about 11% of the total. The rest of the emissions comes from farm equipment, manufacturing of fertilisers, refrigeration, etc. Remember, going the conventional route it takes anywhere from 1 to 10 calories of fossil fuel to produce 1 calorie of food (depending on the crop, and on which study you quote). Which is one reason why biodiesel for transportation is not a workable option. So as we are questioning the issue of food transportation, perhaps we should also be looking into how to reduce the GHG emissions in our food production, the way we are now asking our cars to be more fuel efficient and emit less carbon dioxide. The data makes one thing very clear: the two food groups with largest climate impact by far are red meat and dairy products. 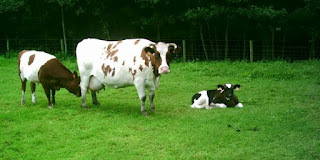 Cows produce methane and nitrous oxide, both powerful greenhouse gases. One of the study's conclusions is that one way to significantly reduce your dinner's climate impact is to stop eating red meat and dairy products. Perhaps it is not surprising that Weber, one of the authors of the study, is a vegan and a locavore. Despite the factors leading to lower cost and lower climate impact of some aspects of the 10,000 mile diet, there are good reasons to become a locavore. These have been covered in many articles and in books like "The End of Food" by Paul Roberts. For me personally, local means fresh; there really is nothing like a tomato that just came off the plant. Local means diversity, and getting away from the global reliance on monocultures that presents its own threat to our food supply. Local means you can shake the hands of the very people who produce your food, and look them in the eye. Local means chatting with friends and other like-minded people around the farm stand. Local is often less expensive. And all else being equal, sourcing your food as close as possible to your table does minimise your dinner's carbon footprint. If you can go local and organic, there are big carbon savings: for the use of synthetic fertilisers accounts for a significant part of the carbon footprint of some conventional crops. Organic farming, on the other hand, acts as an effective carbon sequestration process, so its carbon footprint is actually negative. So my strategy has been to adhere to the ALARA principle, which I have borrowed from X-ray workers' approach to radiation exposure: I strive to keep my food's carbon footprint As Low As Reasonably Achievable, by eating As Locally As Reasonably Achievable. After all, I've got growing children to nourish, not to mention a foodie husband, and a strict potatoes and cabbage diet won't serve them all that well. Local farm: Alas, I am a lousy gardener. If my family had to live off my labours, we would starve. So I am a member of an organic CSA, which gives our family the bulk of our vegetables in the summer (and I freeze whatever we don't eat immediately). They are considering extending the harvest into the winter months. I would sign up for that! Reduce waste: If I know we will be overwhelmed by a particular crop (four big heads of lettuce in a week is a bit much), and I know I can't preserve it, I either share it with friends, or put it in the donation box that my CSA sends to a local food bank. I try to buy a little less than what I need; the occasional thin meal is good for you. The worst that happens is that CelloDad makes himself a slice of toast, particularly when the children are in a growth spurt; then I know the meal has been very thin. Eat in season: Produce tastes best if it's fresh. I avoid eating summer berries in winter time, because those tend to come from another hemisphere; compared to when they're in season locally they're expensive, and not that tasty. For the same reason, I avoid fall crops like apples and pumpkins during the height of summer. It's helpful to educate yourself when each crop is in season. My brother, a city dude who had no clue about crops, devised a trick: if it's less than $2 - $2.50 a pound, he'll buy it, arguing that if it's in season, its abundance will drive the price down. (So yes, he and I come from the same frugal stock). Eat low on the food chain: ViolaPlayer has recently gone vegetarian, and the rest of my crew eat meat perhaps once a week. It's the dairy we have a tough time giving up: we love our milk and kefir, and we're just a cheesy family. ALARA, right? If I tried to cut out the dairy, I would have a revolution on my hands. Keep exotic foods to special occasions. I would have to cut back (oh!) on mangoes and papayas, and stick to peaches and plums. On the other hand, maybe we'll have less Stilton in the house; by CelloDad's own admission that cheese smells of old socks anyway. The rest of us never touch it. But some foods are staples as well as exotic: examples are (sub)tropical crops like rice, coconut oil, tree nuts, bananas, and so on. And some foods follow a long and contorted trail, as in the case of hogs raised in Holland, which are turned into sausages in Italy, and then exported - to Holland, among other places. When you're standing in the store, how would you know? Work at labeling: At the store, I try to go for the produce labeled "local". But such labeling is patchy. In Europe, the produce displays tell you the country of origin, and you can sort of guess whether the foodstuff arrived by air or surface. The general rule of thumb is, if you're going to keep it in the fridge, it came by air (and racked up an incredible carbon footprint along the way). But how do we know? - it would be nice to have a label, much like the nutrition facts, that tells us about the life-cycle carbon footprint of the foods we're buying. It turns out, such a label exists! The Carbon Reduction Label was recently introduced by the UK-based Carbon Trust: this label in the shape of - what else? - a footprint shows the total CO2 emissions associated with the production of one serving of that food. It really is much like the nutrition facts. It's still early days for this label, but it's a hopeful sign that the mainstream UK grocery chain Tesco has adopted it for a selection of its products. The sooner the Carbon Reduction Label is used worldwide the better. There is nothing like full disclosure. This post was written for the July 2012 Green Moms' Carnival on Food Independence, hosted by Abbie from Farmer's Daughter.